Kyle Young earned a bachelor’s degree in music education from Wright State. 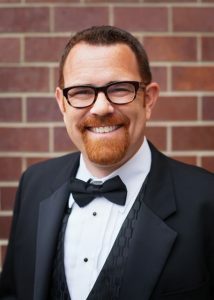 Two of this year’s four national awards from the National Band Association (NBA) have been won by high school bands in Indiana and Nevada directed by Wright State University alumni. The winners of NBA Blue Ribbon Programs of Excellence Award were the Carmel High School band in Indiana, of which Kyle Young is associate director; and the Las Vegas Academy of the Arts Wind Ensemble, of which John Seaton is associate director. “We are humbled to be recognized in this way and give all the credit to our hard-working students and supportive parents, administration and community,” said Young, who earned his bachelor’s degree in music education from Wright State in 2005. The association, the largest professional organization for bands in the world, promotes the musical and educational significance of bands and is dedicated to the attainment of a high level of excellence for bands and band music. As part of the rigorous Blue Ribbon Programs of Excellence application process, schools must submit 40 minutes of live recordings of different ensembles, a listing of honors and achievements of the ensembles and directors, and concert programs from the past three years. They must also submit ratings from concert band festivals or contests, a comprehensive repertoire list of all works performed by concert, jazz and marching ensembles from the previous two years, a listing of students accepted into honor bands or orchestras, reports of solo and ensemble participants as well as their ratings and difficulty of music, and references from guest conductors, evaluators or adjudicators who have worked with or listened to the group over the last three years. Division winners of the award make up the pool of bands considered for the national awards. 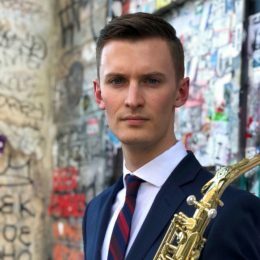 John Seaton earned a bachelor’s degree in music education with a saxophone concentration from Wright State. Young said creating a culture of excellence has been instrumental in the success of the Carmel Band. “The expectation of excellence was started many years ago and has been the foundation of our program ever since,” he said. Seaton said he is grateful to the faculty in the Wright State School of Music for their unwavering support and invaluable teaching. “Shelley Jagow, my saxophone professor, and many others were incredibly giving of their time and talents,” he said.